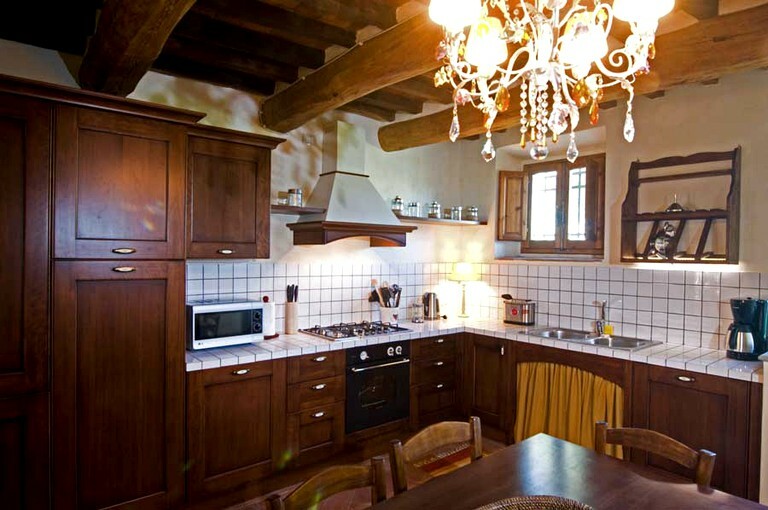 This charming Tuscan getaway is situated near Florence, Italy, and can accommodate up to six guests. 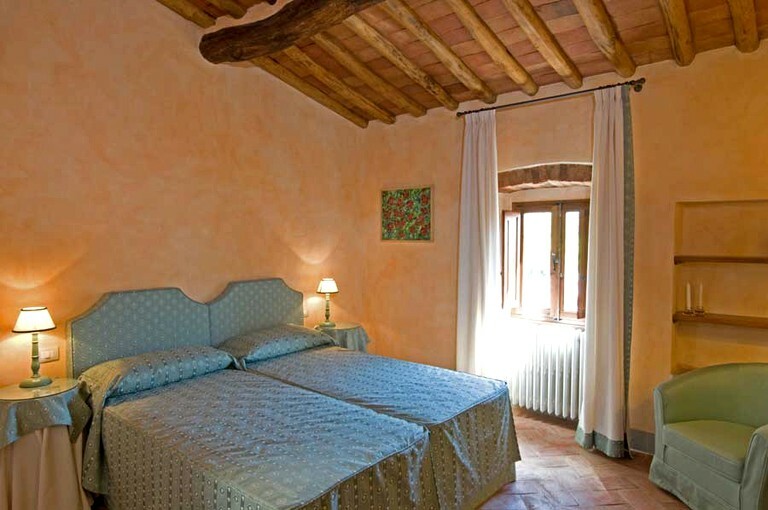 There are three bedrooms and two full bathrooms in this lovely accommodation. The first bathroom has a toilet, a sink, and a shower, while the second bathroom has a toilet, a sink, a shower, and a luxurious Jacuzzi bathtub. Each of the three bedrooms features double-size beds that can be joined together or separated depending on guests' preference. Linens and towels are kindly provided by the host. In the living room, guests will find a cozy sofa and a gorgeous piano available at for an additional fee. Guests will also have a second lounge room featuring a fluffy sofa that can be converted into a bed if guests require additional sleeping space. The kitchen is equipped with an array of cooking and serving utensils and all of the modern appliances guests might need to feel at home during their stay. Other amenities include air-conditioning in the bedrooms, satellite TV, complimentary Wi-Fi, and a radio. Guests will be able to immerse themselves in the tranquil ambiance of their breathtakingly beautiful surroundings while still enjoying access to modern amenities and conveniences during their stay. The property features a shared swimming pool shaded by majestic olive trees where guests can go for a dip. There is also a spacious outdoor lounge area furnished with tables and chairs for al fresco dining as well as lounge chairs with umbrellas perfect for relaxing with an Aperol Spritz. Other shared amenities include a laundry facility with a washing machine, a barbecue area, five bicycles, a tennis table, a football table, and free parking on the premises. 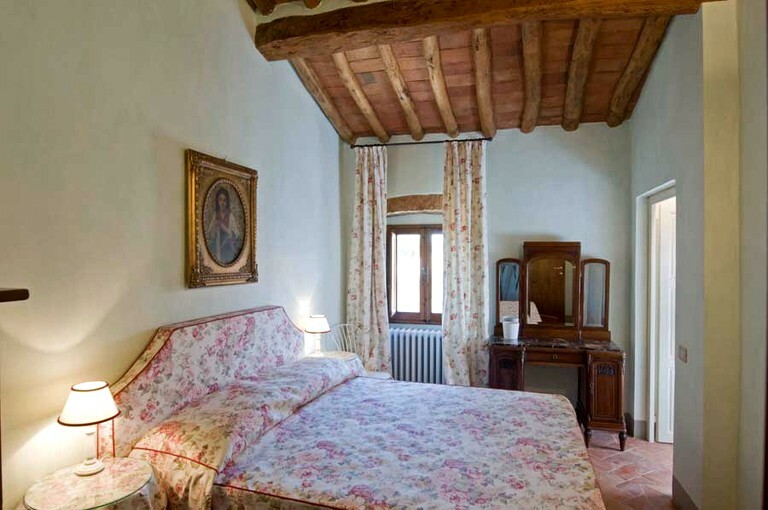 Each individual accommodation features Tuscan-colored walls, terracotta floors, original art and antiques, and beautiful fabrics to create an authentic Italian ambiance. Guests will have air-conditioned bedrooms, satellite TV, complimentary Wi-Fi, a radio, and an equipped kitchen. Weddings and receptions can be arranged upon request. In the garden, there is an elegantly decorated loggia ideal for small parties and receptions. Additionally, catering and chef services are available upon request. 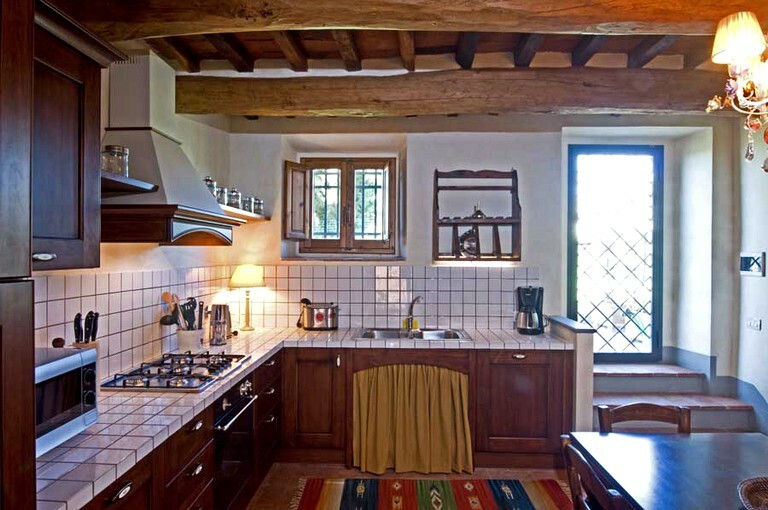 This incredibly charming property is nestled among lush vineyards, olive groves, and fields of sunflowers situated at the end of a country lane lined with cypress trees in the Chianti Classico region of Italy. 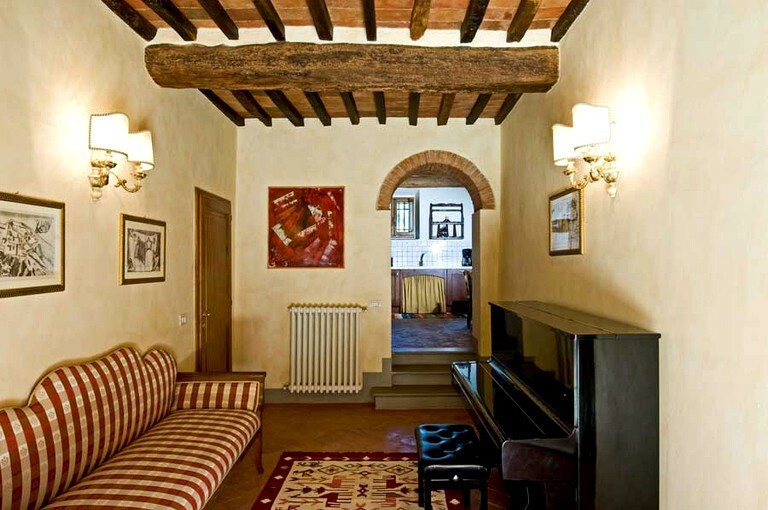 Although the setting may feel like a completely remote getaway in the heart of Chianti, the property is actually just 20 minutes from Florence, 45 minutes from Tuscany, 50 minutes from Siena, and one hour from Lucca. Montalcino and Pienza are a one and a half hour's drive, while the Thyrrenian Sea is one hour away. 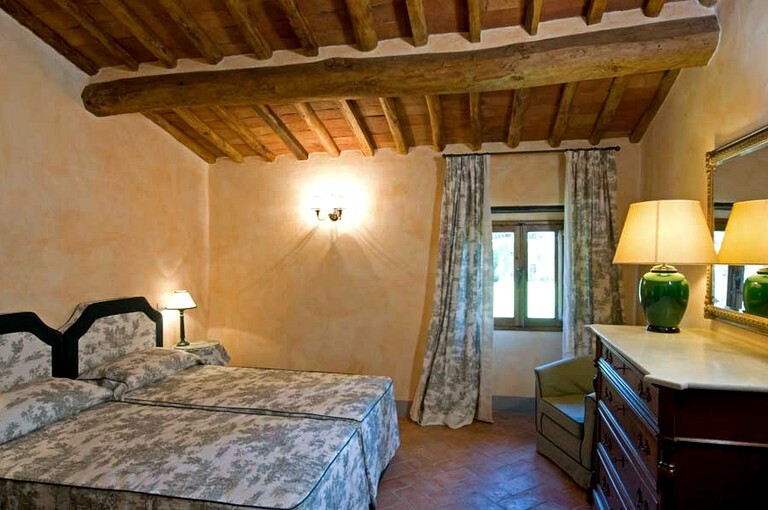 Situated in the heart of Tuscany and surrounded by awe-inspiring natural beauty, guests will have a multitude of options for outdoor recreation and adventure during their stay. Guests can explore the Tuscan countryside on foot as they hike their way through Garfagnana, Lunigiana, Casentino and the Florentine hills. These areas provide treks for hikers of all levels and offer stunning panoramas of the surrounding landscape. Glampers can also ride one of the bicycles provided by the host through region's abounding the hills and friendly villages. Another great way to view the countryside is on horseback, and guests will be just a couple of miles from a riding facility. Glampers will be just over an hour from the coast, where they will be able to soak up the sun and enjoy the sparkling waters of the Ligurian Sea. The port city of Livorno is a great day trip option featuring fresh seafood, a waterside promenade, and striking Renaissance-era architecture. Wine lovers should be sure to visit the wine-making meccas of Montepulciano, Brunello, Chianti, and Montalcino for a day of wine tasting and tours of the vineyards. Additionally, the region is home to many unique natural hot springs where guests can soothe sore muscles in the restorative waters. Whether they are seeking a relaxing retreat or an action-packed adventure, there is something for glampers of all interests to enjoy together during their stay in this incredible area. For large groups, it is possible to place a table suitable for 22 guests either in the largest accommodation or on the terrace facing the pool. A $495 refundable damage deposit is required upon booking. The consumption of electricity, heating, and air conditioning for the amount of $60 per unit per week is included and guests must pay anything that exceeds this amount.